The Taiwan-based PC maker Asus has reportedly introduced another high-performance laptop, dubbed K73SD-TY2670 aimed at multimedia aficionados and casual gamers. The portable device is now commercially available to customers in Japan and has a starting price of 99,800 JPY (about $1,200). According to the manufacturer, this new powerful notebook is powered by up to a Sandy Bridge Intel Core i7-2670QM central processing unit, which incorporates four physical cores with a clock frequency of 2.2GHz (up to 3.1GHz through Turbo Boost 2.0) and the Intel HD 3000 graphics controller on the same die. Furthermore, the K73SD model sports a 17.3-inch widescreen LED-backlit LCD display that delivers a maximum supported resolution of 1600-by-900 pixels (HD+). Featuring a “classy metallic design”, Asustek’s latest high-performance portable computer is built around the Intel HM65 Express Chipset and packs 8GB of DDR3 RAM, a 750GB mechanical hard drive, and the discrete NVIDIA GeForce 610M GPU (40nm Fermi architecture) with 1GB of dedicated video memory. Reportedly, users will be also provided with four USB 2.0 ports, an HDMI interface for hooking up the notebook to an external HD monitor, 4-in-1 card reader slot, an RJ45 port and an integrated 0.3MP front-facing web camera for video calls. Connectivity-wise, the K73SD offers Wireless LAN 802.11 b/g/n, wired T Base and an optional Bluetooth 4.0 modules. Other specs include a Blu-ray optical drive, built-in Altec Lansing speakers, 5200mAh battery and Asustek’s IceCool Technology that apparently “lowers temperatures to maintain a comfortable palm rest feel”. 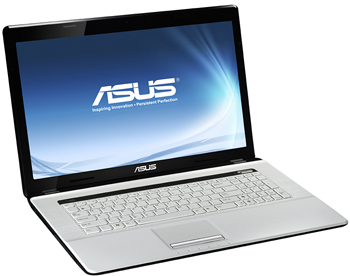 The product’s page further indicates the laptop weighs 3.11kg (with the battery), measures about 3.6cm at its thickest point and comes with up to a 64-bit Windows 7 Ultimate operating system.